Home » Early African Religion – what was the first religion? 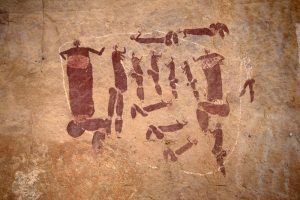 The earliest evidence we have for religious faith anywhere in the world is from Blombos Cave in South Africa, where people may have been using red ochre for funerals about 100,000 years ago. 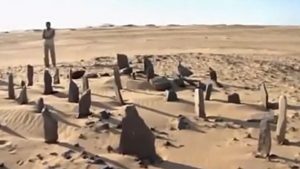 Around 6000 BC, people put up standing stones in East Africa (modern Sudan). These stones may have marked the changing seasons. Maybe the standing stones at Nabta Playa showed people when to hold important religious ceremonies. Ancient Egypt: In Egypt, by 3000 BC people were already worshipping Isis, Osiris, Ra, and the Amen. 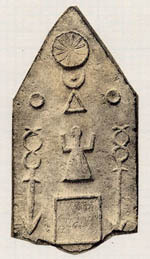 Further south in Sudan, the Kushites seem to have also worshipped these gods, along with their own gods, Apedemak and Sebiumeker. Some Nubian gods, like Bes, seem to have travelled north from Sudan to Egypt too. 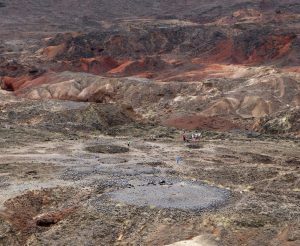 East Africa: South of Sudan, in Kenya, also around 3000 BC, people living around Lake Turkana built a large cemetery with mounds, stone circles, and large standing stones. We don’t know who their gods were, but they thought funerals and cemeteries were important. West Africa: In West Africa, however, the Bantu people seem to have been more monotheistic. They thought of there being one god, sometimes a sky god or sun god and sometimes not. By around 1300 BC, we can see the first strains of an interest in monotheism emerging in Egypt, too, with Akhenaten. Did Akhenaten get the idea to worship only one god from West Africans? Nobody knows. Polytheism triumphed when Akhenaten died, though, and survived through the conquest of North Africa by the Phoenicians who introduced their own gods to North Africa, like the goddess Tanit and the god Ba’al. Tanit was a moon goddess – that’s why she has a crescent moon over her head on this carving. In North Africa, she was probably a mixture of the old Phoenician goddess Tanit and a local African moon goddess. Ba’al was Tanit’s husband: his name just means “Lord”. People sacrificed young sheep and goats, and maybe sometimes even their own children, to the god Ba’al. The Greeks, and then the Romans, soon added their gods to the gods worshipped in North Africa. Need a Halloween costume? Get this African mask from Congo and go as a scary spirit! 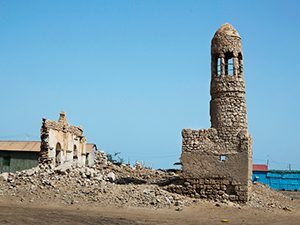 Around 300 AD there was a second great change in African religious belief when many North and East Africans gradually followed the Roman Emperor’s lead in converting to the monotheistic faith of Christianity. The great Christian theologian St. Augustine was from North Africa. By the 500s AD Christianity won over most of North Africa, including Egypt, and also the kingdom of Axum south of Egypt (modern Sudan, Eretria, and Ethiopia). The Christians of North Africa were split among the Donatists, the Catholics, and then the Vandal Arians. In this same time period, the Bantu were gradually expanding across southern Africa, bringing their faith with them. Bantu faith continued to de-emphasize polytheism, while having instead a firm belief in ghosts and their power over living people. Some of these ghosts were your own dead parents or grandparents. Others might be the ghost of a dead king or hero, and these might be remembered for a long time, rather like Christian saints. In the late 600s AD, another monotheistic faith, Islam, came to Africa, first across the Red Sea to Somalia and Eretria, then to Egypt. After that, Islam spread rapidly across North Africa. A hundred years later, almost the entire population of North Africa had converted to Islam. Islam quickly spread across the Sahara Desert as well, so that many people who lived in the grasslands south of the Sahara became Muslims too. All the way south to the great rain forests, there were many Muslims or people who followed at least some Muslim beliefs. And, thanks to Arab and Indian traders, the entire east coast of Africa became Muslim, as far south as Mozambique. Sudan also became mostly Muslim. So most of the people who lived in Africa were Muslims. Even though many people converted to Islam, many other people didn’t. Ethiopia stayed Christian. 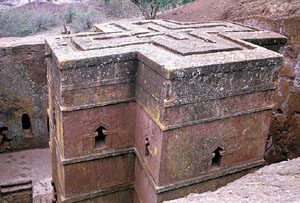 People in medieval Ethiopia built big stone churches and wrote long books of Christian prayers and Bibles. 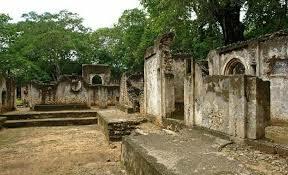 South of the rain forests, in central and western Africa, Bantu religion remained dominant. And in the Kalahari desert, the San people kept up their own faith. It was very similar to the Bantu faith in its emphasis on ancestor ghosts. Did you find what you were looking for about early African religions? Do you have more questions? Let us know in the comments! A Coalition of Lions, by Elizabeth E. Wein (2003) – A novel about Christian Africa in the 500s AD- warning: this book is the second in a series! Cite this page: Carr, K.E. Early African Religion – what was the first religion?. Quatr.us Study Guides, May 18, 2017. Web. April 23, 2019. That was great thank you!! are there what they played for games for this? Hi Robert, thanks for visiting! How can I help you? What were you trying to find out? Hello Karen! I love this website and it gave me LOTS of information! I love it! Wonderful! I’m glad we could help, Jessica! Thank you, Anthony! I’m happy to hear that we’re cool! Sorry, what were you trying to find out? Maybe I can answer your question? My name is Caeb. My favorite color is monochromatic and I eat rcks. Pretty sure Caleb meant it as a joke, dude. Thank you! I’ve always wanted to be cool! Hi my name is Karen! Thanks for stopping by.